Why are American star chefs like Roy Choi so fascinated by the food scene in Melbourne? Writer Julie Powell flies across the planet to find out. Roy Choi is so excited, he can’t get the words out fast enough. “It’s like a miniaturization of all my favorite cities: Tokyo and Seoul and New York and Los Angeles, all in one.” The F&W Best New Chef 2010 and famed owner of Los Angeles’s fleet of Kogi BBQ Korean taco trucks traveled to Melbourne, Australia, in 2011, and he returned a passionate devotee of the city. (He even has a commemorative tattoo on his left wrist: the street address of the restaurant Coda, where he did a guest stint.) Now I am heading to Melbourne myself to find out why ambitious young American chefs are so transfixed by its food scene. It has been a long time since I’ve felt that excited about restaurant food. I am hoping Melbourne’s earnestness will soften the harder edges of my New York City neuroses. At Golden Fields, empire builder Andrew McConnell uses Asian ingredients such as Kewpie mayonnaise in his crayfish roll.Photo © Earl Carter. Ben Shewry’s Attica restaurant, in a Melbourne suburb, has been on the San Pellegrino World’s 100 Best Restaurants list for three years running, so I figure it’s a must-visit for my eating tour of the city. 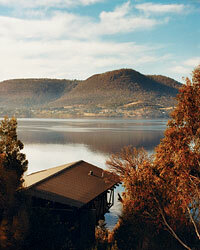 A transplant from New Zealand, Shewry grew up on an isolated farm by the ocean. When he moved to Melbourne, he found himself obsessively drawn to the native foods that some Australians might dismiss as “bush tucker.” As he walks me through the restaurant’s extensive gardens, he plucks a purplish two-lobed fruit from a towering tree. “Pine plum.” He peels away the smaller of the two lobes, then hands the other one to me. “It’s got this intense aftertaste. Some people don’t like it. Try one.” The inky juice of the fruit stains my fingers; the flavor starts like a stone fruit, then goes puckeringly piney. It’s a challenging flavor, and one you won’t taste outside of this region—which is just Shewry’s point. The eggshell is white chocolate. When I bite into it, my mouth fills with salted caramel, and I’m hit with a memory from growing up: a day when my grandmother slipped me something off my mother’s verboten list. Shewry had gifted me with a grown-up version of the Cadbury Creme Egg. 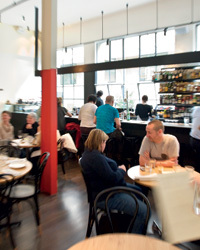 In Melbourne, there’s a superabundance of up-and-coming restaurants. As in New York City, it sometimes seems that there’s a different place to eat for every citizen. Smith Street in the suburb of Collingwood is, much like Smith Street in Brooklyn, an energetic strip of restaurants and bars, often run on shoestring budgets by young hopefuls. Among these is Easy Tiger, a relatively new Thai spot. There is nothing fancy about Easy Tiger, with its inexpensive menu of family-style plates, narrow dining room and funky courtyard out back. What’s bringing people here is an idea carried out with maniacal focus. Chef Jarrod Hudson is mad for the craziness of Thai food, its complex mix of hot, sweet, bitter and sour. The air is redolent with the spices that Hudson and his crew laboriously grind and mix by hand daily. The earthy, red oxtail curry has me gulping water, chile fiend though I am. All around me diners are unfazed, digging into crispy soft-shell crabs with house-made Sriracha, and ma hor, a shockingly sweet bite of prawn, pork and chicken cooked in palm sugar, served on a square of pineapple. I overhear someone refer to the ma hor as “dessert first.” It shouldn’t be good, but it is. The meal ends with chocolate and pandanus-leaf dumplings with melon and salted coconut cream. They are very weird, and just right. 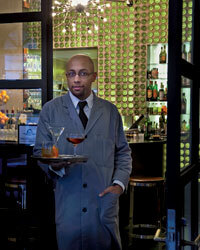 Bar Ampere’s bartenders, dressed in lab coats, shake up cocktail experiments.Photo © Earl Carter. After they’ve eaten, Melbournians wander down alleyways and slip behind unmarked doors or up creaky sets of stairs to one of the city’s “laneway bars.” Supposedly. I have heard tell of these mythical places but have yet to manage to find one. Tonight, though, I am armed with maps, carefully drawn and marked on the backs of old menus or bar napkins by helpful waiters and strangers. One couple I meet at the beloved tapas bar MoVida leads me six or seven blocks out of their way (“Typical Melbourne,” I imagine Roy Choi whispering) to show me Meyers Place, one of the great examples of the genre—but it’s not open yet. One of the mysteries of the laneways’ bars is the incomprehensible hours they keep. I wander alone, squinting with increasing despair at my cocktail napkins. I pass by the restaurant Pei Modern, which Banjo Plane, the manager of Attica, had recommended. I stay the course, but I worry that I’ll never find one of these alleged pocket bars. And then there one is, down a cobbled alley, under an archway next to an electrical substation—Bar Ampere, tiny enough to happily entertain hobbits. Inside it looks like a 1930s-era laboratory, with white tile, a wall of wine bottles and a dark varnished bar shaped like a horseshoe. The diminutive, mustachioed and lab-coated fellow behind the counter welcomes me and, at my request, pours me a cocktail newly minted and enigmatically named: the Keen Keener, made with gin, China Martini liqueur, Herbsaint and both orange and Angostura bitters. The Sharing House, in the waterfront district, serves family-style dishes like mussels with tomato and cumin.Photo © Earl Carter. We’re sitting at a window-side table at the Sharing House, the latest of five restaurants he’s opened in less than a year. Mathis needn’t worry; the bright room with huge ceilings feels just right. Its bar is inlaid with Lego blocks, and the floor-to-ceiling windows look out on the docks and warehouses of Melbourne’s newly developing South Wharf district. 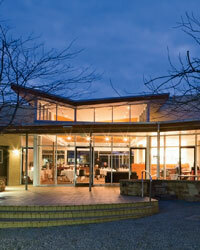 As its name suggests, the menu encompasses both small plates and enormous family-style servings. I smear buttery potted shrimp over tiny crumpets as fast as I can before they cool; a mastodon-size slab of perfectly pink beef Wellington looms on the table before me. Right next door, just a thin partition away, is an entirely different venture, Akachochin, Mathis’s new Japanese restaurant. New York City-based writer Julie Powell is the author of Julie & Julia and Cleaving. World-famous chef Ben Shewry showcases native Australian ingredients in what he calls “emo”—emotion-stirring—dishes of enormous delicacy. attica.com.au. Photo © Earl Carter. To flavor authentic Thai dishes like oxtail stew, Jarrod Hudson and his staff grind Thai spices daily. easytiger.co. Photo © Earl Carter. In this bar, concealed in one of Melbourne’s narrow lanes, bartenders in lab coats serve creative cocktails, plus wine that has been infused with liquor and herbs. barampere.com. Photo © Earl Carter. Restaurateur Paul Mathis has opened five restaurants in less than a year. His latest has cute design touches (a bar inlaid with Lego blocks) and comfort food served family-style. thesharinghouse.com.au.--> Photo © Earl Carter. Shannon Bennett’s restaurant has a new location atop a skyscraper but the same ultra-elegant food. Prix fixe menus start at $158. Rialto 525 Collins St.; vuedemonde.com.au. 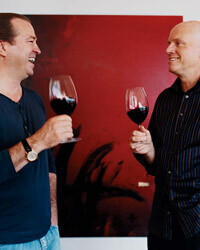 Sophisticated French bistro food from Sydney star chef Mark Best. peimodern.com.au.